Lil' Inker: Color Throwdown Wednesday & New Product Sneak Peeks!!!!!! Color Throwdown Wednesday & New Product Sneak Peeks!!!!!! So for this week's Color Throwdown Challenge, I chose a pretty palette of colors inspired by Echo Park's Springtime Collection! But, this week's challenge will be slightly different than week's past. You can pick ANY combo of colors to work with from the Springtime Collection. Pick a combo any combo! Isn't that fun?! Now, before I begin with my projects. Let me tell you a little bit about the new release products (coming soon) from Lil' Inker Designs. The theme is RAINBOWS and coordinating clouds! There are four dies in this set: 2 different rainbow dies and 2 clouds. The clouds feature an adorable shape (which I drew by hand and Ariana digitized) as well as this uber-cute perforated line detail which I think sets them apart from anything I've seen on the market. The small, full rainbow cuts three different *bows* so you can mix and match with different papers, or mediums like felt and the larger rainbow is more like an arc which cuts four *bows* for a bigger, but unique look. Of course, there is a coordinating stamp set in a fun and funky combo of fonts which I think you will love. My first card uses the Pinwheel die and a sentiment combo from the Rainbow Sentiments stamp set. The "You make me" and the "Smile" are two different stamps so they can be combined with other words in the set or even stamped in different colors. 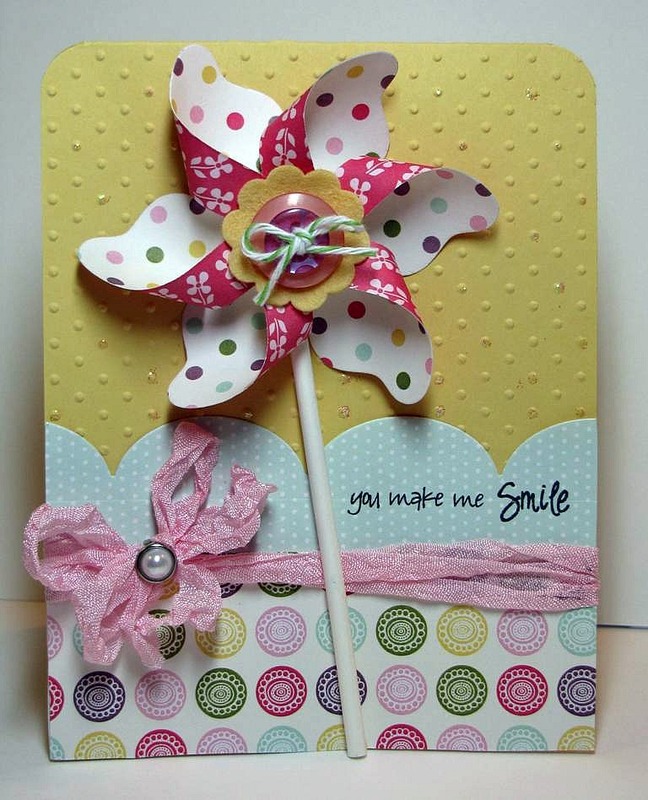 I started by cutting my Pinwheel petals, assembling and embellishing. Then I made a card base, embossed it and added papers from the Springtime Collection from Echo Park. I added in some crinkle ribbon from a shop on Etsy and stamped my sentiment in bold, black ink to make it jump right off the page. 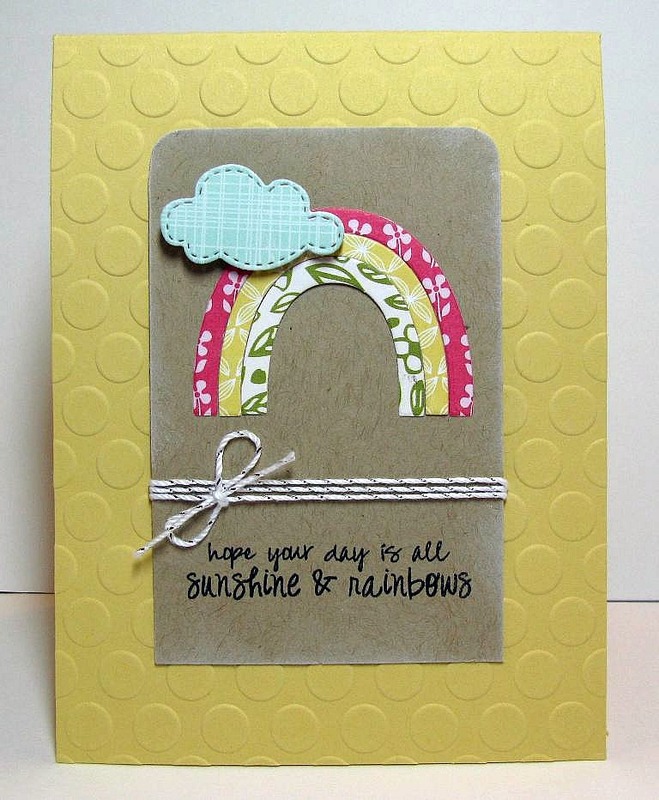 My second card for today features the small rainbow and cloud dies and a sentiment from the stamp set. I started by running my Rainbow die through my cutting machine with different sheets of the Springtime papers. Once I had the color combo I liked, I adhered everything to a kraft panel and stamped that fun sentiment, which I think can be used for tons of different occasions. I rounded the top corners of the focal point, sponged the edges with white ink and then embellished with this white and silver twine that I love and can't stop using. I then added my focal panel to a saffron base which I embossed with polka dots, added in some additional details and called it done! Easy! Still with me??!! I hope so!!! My final project uses the larger Rainbow die and large cloud die with this fun "On Cloud Nine" sentiment. I cut the rainbow the same way as above with different papers but incorporated one from the A Walk in the Park collection as well. I layered everything right on kraft paper and just did a crazy stitch around the edges and kept it clean and simple. Seriously, these clouds make me squeal!!!! I am totally in love with the perforated cut line! It just makes them so cute and happy! The On Cloud Nine sentiment is a fun one. I'm sending this to a friend I just found out is having her first baby and I am literally on cloud nine for her as I'm sure she is too. Wellllll.....whatta ya think? I have to say I am delighted with how these dies and stamps turned out. They are perfectly paired with the Springtime collection papers and they were fast cards to come together as it was easy to just let the dies do the work for me. I hope you love the projects today! And I hope I've inspired you to play along with this week's Color Throwdown Challenge. Don't forget to visit the blogs of my fellow design team for more inspiring work with our Pick A Combo challenge. And don't forget to read up on all the challenge participation details at the CTD blog! And a quick but GREAT BIG thank you to Jen Mitchell for being with us as our Guest Designer for the month of May which I can't even believe has come and gone so quickly! Have a great long, Memorial Day weekend ALL and stay tuned for more sneak peek projects using the upcoming, new release from Lil' Inker Designs!! the clouds ARE darling and the rainbows are fab... looking forward to more sneaks! Your cards look great. Love the bright colors and EP paper is lovely. Fabulous bunch of cards, girlie!!!! Love the new dies!!!! Laura, I am beyond excited with these new rainbow/clouds dies!! Where can I view the sentiment stamps in the set? Looked, but couldn't find em. I. CAN'T. WAIT. TO. GET. MY. HANDS. ON. THESE. DIES. AND. STAMPS!!!!!!!!!!!!!!!!!!!!!!! Absolutely darling cards, girlfriend! oh yeah! 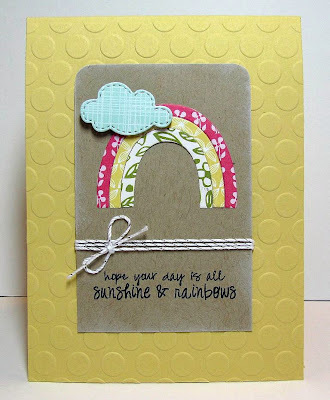 LOVE that cloud and rainbow and sentiments! very cool w/the pattern papers and love the embossed and kraft for backgrounds! they are SO fun to make!!! So so adorable!!! I am in love! Love the cloud, Laura--the perforation detail is awesome!